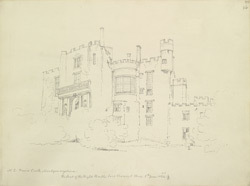 The Herbert family took over Powis Castle in the 16th century and embarked on a programme of repairs and modernisation. During the Civil War (1642-1646), the castle was occupied by Parliamentarian forces who destroyed much of this work. Successive generations of Herberts continued to transform the castle from medieval fighting fortress into the refined stately home and grounds it is today. The famous terraced gardens were designed in the 18th century according to popular French and Italian designs and drew admiring visitors from all over Europe.